LA Theatre Works’ traveling production of Robert Harling’s “Steel Magnolias” — a comedy/drama about six women in Chinquapin, La., facing life’s ups and downs together — makes a stop at the McCallum Theatre, 73000 Fred Waring Dr. in Palm Desert, on Monday, Feb. 25, at 7:30 p.m.
Orginally a hit Off-Broadway show, the play reached a nationwide audience through the 1989 movie adaptation. Variations have included a TV movie with an African American cast in 2012 and an all-Asian version by L.A.’s East West Players in 2013. 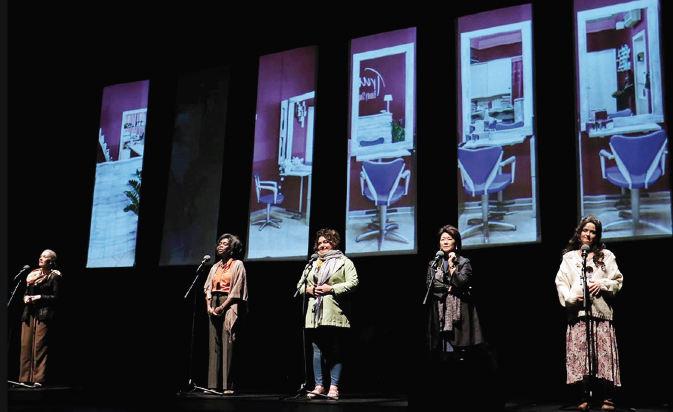 Directed by Brian Kite, the LATW production is done like a radio show with the actresses standing side by side, facing the audience, speaking into microphones. There is no set but images are projected in the background. The multiethnic cast consists of Elisa Bocanegra as beautician Truvy (Dolly Parton in the movie); Shannon Holt as Ouiser, the town curmudgeon (Shirley MacLaine in the movie); Inger Tudor as social worker M’Lynn (Sally Field in the movie); Monica McSwain as Shelby, M’Lynn’s daughter (Julia Roberts in the movie); Cerris Morgan-Moyer as Annelle, apprentice beautician and newcomer to town (Darryl Hannah in the movie); and Patti Yasutake as Clairee, the town’s former first lady (Olympia Dukakis in the movie). Unlike the movie, the husbands and other male characters are mentioned but never seen. The 28-city national tour, with one performance per stop, began Oct. 12 and ends March 8. Yasutake, whose TV roles include Nurse Ogawa in “Star Trek: The Next Generation,” appeared in the East West Players production as M’Lynn, along with Hiwa Bourne as Truvy, Ruth Coughlin as Shelby, Karen Huie as Ouiser, Dian Kobayashi as Clairee, and Lovelle Liquigan as Annelle. Asked what it was like to join the LATW version, Yasutake said, “There were various factors to consider, such as touring, format, etc. Having done the play was a plus in that consideration, especially given the short rehearsal. Even though it’s a different role, my familiarity with the play’s overall structure, storytelling, relationships, dynamics, themes and such allowed me to spend the limited time focusing primarily on creating another character along with new relationships, plus learning a new format. “The different format was the biggest challenge. In this radio-style yet live theatre-type format, every actor’s entire focus is straight ahead towards the audience behind stand microphones. The other characters are onstage, but we cannot look at each other. So the audience sees what each character is doing, but each actor cannot see with what expressions and reactions they are interacting. All our cues are vocal and audio, making everything we do entirely reliant on listening. Yasutake has gotten more comfortable with the format as the tour, which started in Livermore (Northern California), made its way to Fairfax, Va.; Hoover, Ala.; The Villages, Fla.; College Station, Texas; Flushing, N.Y.; Selisgrove, Pa.; Iowa City, Iowa; Albuquerque, N.M.; Kirksville, Mo. ; Athens, Ohio; Glendora (Los Angeles County); Hillsdale, Mich.; Galloway, N.J.; Manassas, Va.; Frederick, Md. ; Green Valley and Gilbert, Ariz.; Overland Park, Kan.; and Orange, Texas. 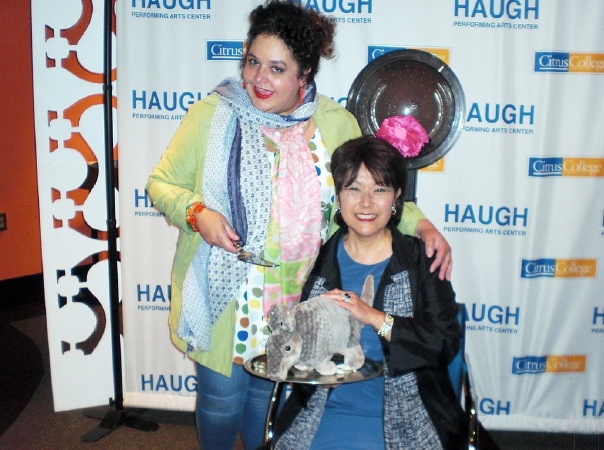 Yasutake added, “The play takes place in northern Louisiana — based on the playwright’s sister and mother — so Southern audiences are particularly receptive, responsive, and fun. But Midwest and Southwest audiences, too. In addition to Palm Desert, the show will travel to Alma and Conway, Ark. ; Tacoma, Wash.; Danville, Ky.; Maryville, Tenn.; Clermont and Palm Beach, Fla.; and finally Morristown, N.J. — after which Yasutake will take a well-deserved rest. For tickets to the Palm Desert show, call (760) 340-2787 or (866) 889-2787 or visit https://www.mccallumtheatre.com/. For more information on the tour and the cast, visit https://latw.org/current-tour.